Hydraulic cone crusher has large crushing ratio, high crushing efficiency, low power consumption and uniform products granularity, which is suitable for the secondary and fine crushing of various kinds of rocks and stones. 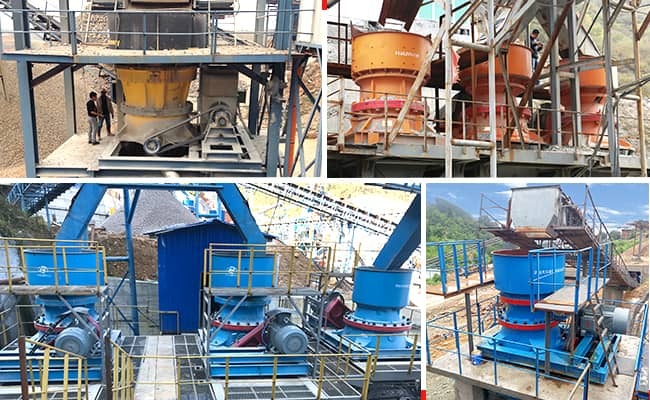 The hydraulic cone crusher produced by Luoyang Dahua includes GPY single cylinder hydraulic cone crusher, HPY multi-cylinder hydraulic cone crusher, AF and DHGY hydraulic cone crusher. 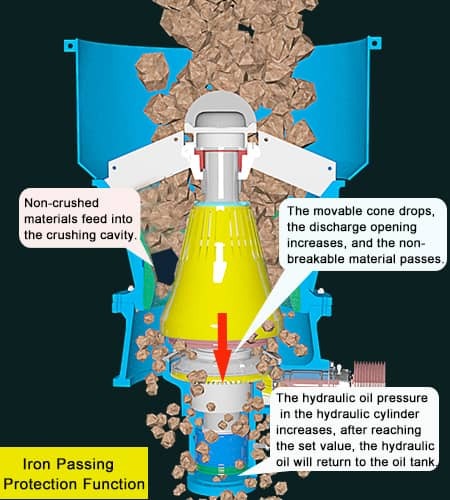 In this ext, we focus on the introduction, model and features of GPY single cylinder hydraulic cone crusher. Dahua GPY hydraulic single cylinder cone crusher adopts high-strength cast steel frame, alloy forging spindle, high-precision straight tooth bevel gear transmission structure, combined with a variety of crushing cavity and automatic control system, can be widely used for the secondary and fine crushing of hard minerals and rocks. Dahua GPY single cylinder hydraulic cone crusher has two series: GPY-S series for secondary crushing, GPY series for fine crushing. It has wider adaptability, and can be adapted to different production processes through adjusting the eccentricity, to maximize the value of equipment. • GPY400S - it is used for the processing capacity of 500 t/h. • GPY650S - it can be used for the processing capacity of 1000-1200 t/h working with large-scaled jaw crusher. • GPY800/1000 – it is special for crushing of steel slag and metallurgical slag, with iron passing protection function. 1. The main shaft is a "simply supported beam" structure. Both ends support, the spindle bearing capacity is stronger. 2. Large feeding opening, elongated crushing chamber, and the top frame is divided into upper and lower parts. Dynamic pressure lubrication system of eccentric sleeve can reduce the temperature of bearing after heating. 3. Automatic system with overload protection and iron protection function. It can monitor oil temperature, oil quantity, crushing pressure, and size of feed opening, etc. 4. Adoption of lamination crushing principle makes the machine has high production efficiency, large processing capacity, better particle shape and lower unit energy consumption.